Doctor Who fans last saw her on Saturday meeting a grisly end at the hands of the Cybermen. But newcomer Freema Agyeman will next year regenerate into one of the most recognisable faces on British TV when she replaces Billie Piper as the Doctor's assistant. Jane Tranter, the controller of BBC drama, said yesterday that Agyeman, 27, whose CV to date includes appearances on The Bill, Casualty and Crossroads, will be thrust into the limelight as Martha Jones. The new character will replace Piper's Rose Tyler in the third series of the science fiction show since it was revived to great acclaim and ratings success by the BBC. Piper is to leave at the end of the current series. "Billie rightfully built up an amazing fan base and she will be missed, but I hope the fans are willing to go on new adventures with me," said Agyeman, who was born and raised in north London by her Iranian mother and Ghanaian father. "It still hasn't quite sunk in." 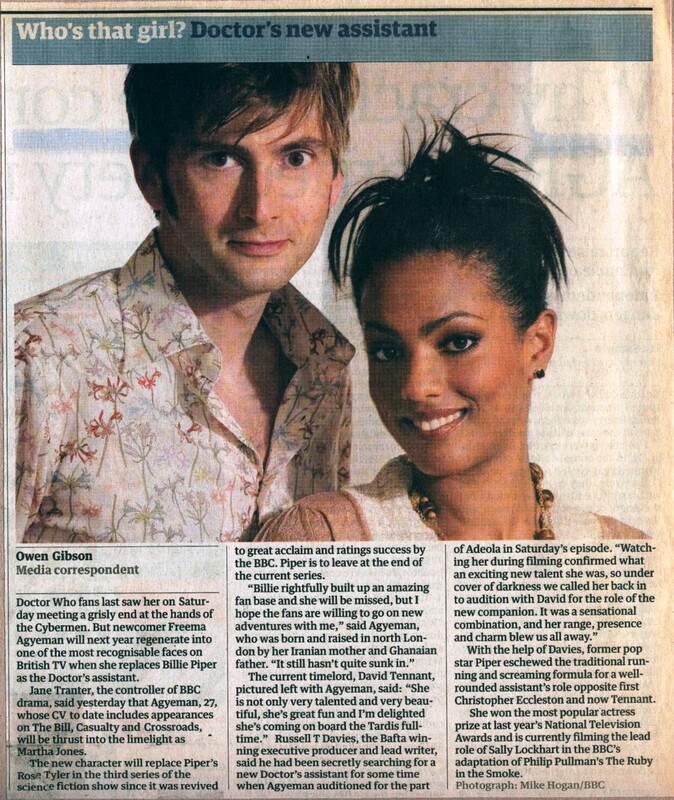 The current timelord, David Tennant, pictured left with Agyeman, said: "She is not only very talented and very beautiful, she's great fun and I'm delighted she's coming on board the Tardis full-time." Russell T Davies, the Bafta winning executive producer and lead writer, said he had been secretly searching for a new Doctor's assistant for some time when Agyeman auditioned for the part of Adeola in Saturday's episode. "Watching her during filming confirmed what an exciting new talent she was, so under cover of darkness we called her back in to audition with David for the role of the new companion. It was a sensational combination, and her range, presence and charm blew us all away." With the help of Davies, former pop star Piper eschewed the traditional running and screaming formula for a well-rounded assistant's role opposite first Christopher Eccleston and now Tennant. She won the most popular actress prize at last year's National Television Awards and is currently filming the lead role of Sally Lockhart in the BBC's adaptation of Philip Pullman's The Ruby in the Smoke. APA 6th ed. : Gibson, Owen (2006-05-07). Who's that girl? Doctor's new assistant. The Guardian . MLA 7th ed. : Gibson, Owen. "Who's that girl? Doctor's new assistant." The Guardian [add city] 2006-05-07. Print. Turabian: Gibson, Owen. "Who's that girl? Doctor's new assistant." The Guardian, 2006-05-07, section, edition. This page was last modified on 9 November 2015, at 23:37.